Branding have always been a topic that I've always taken an interest in. And for me, the most exciting part would have to be the branding of a new concept, be it a new company or a new product. Because everyone knows that first impression counts. That's the easy part. The hard part - re-branding. After an impression has been formed, its hard to go around changing things, but with the right mechanics, I'm sure there's a way to get things done. The same theory applies to restaurants. When I stepped into Purple Pasta that evening, I thought to myself - this place looked familiar. 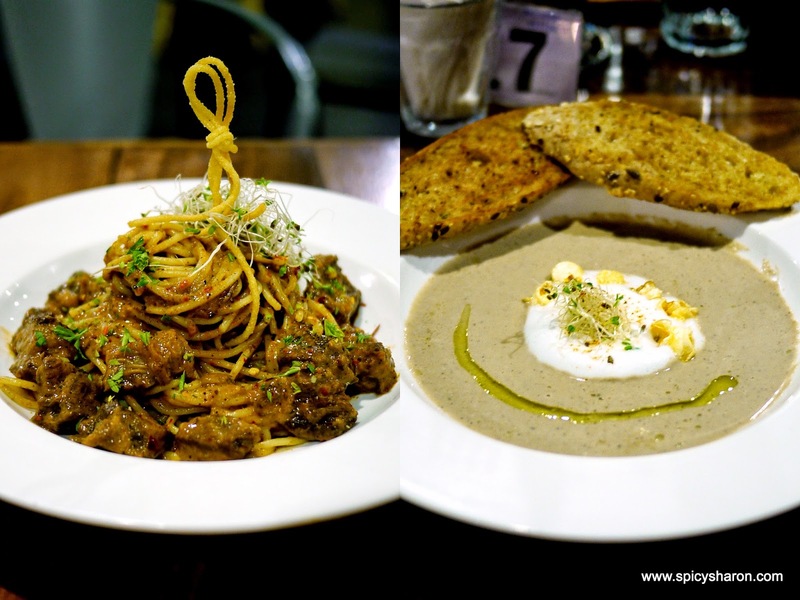 I later found out that I've indeed visited the same shop in the past, when it was known as Epiphany Coffee & Tobacco, which has since been revamped into Purple Pasta, with a brand new concept and a completely new menu in place. I couldn't wait to dig into my dinner that evening! For a cafe of this size, I was pleasantly surprised to see such an extensive menu. There are surely something in here for everyone! Nevertheless, I'm going to make things a little simpler for you. What you're about to see below are some of their all time favorites here. Homemade Cooler (Rm10). Iced Grape Juice (Rm9). This grape fruit juice is the real deal - fresh grapes that is blended only upon ordering. Please order this! We really enjoyed the mushroom soup. No - that's an understatement. This was fantastic! In the middle, foam topped with popcorn, alfafa and parmesan sprinkles. This was gone in seconds. Elegant Fish with Chips. Rm18. How pretty! Now where shall I start - chips, salad or dory fillet? I decided with the mashed russet potatoes beneath first. At the side, homemade tartar and tomato sauce. Withal, a really delicious plate of elements. Chicken Chop with Cherry Sauce. Rm20. Chicken chop with cherry sauce! Now, that's a first. I thought the cherry flavors were very well balanced and the mashed potatoes with truffle oil beneath were fluffy and nicely done. Fra Diavolo Mutton v2.0. Rm25. Everyone went wow on our first mouthful. The mutton chunks had melt in the mouth textures and the dynamic ingredients that goes into making the sauce - dark chocolate, grape compote, tomatoes and cream - clever. I thought it had flavors that resembled our traditional rendang. Once this was placed on our table, I thought - that's a huge portion for 5 bucks. Cream-less spaghetti with sprinkles of parmesan, oregano, alfafa and a poached egg. Vegans - you would definitely enjoy this. This felt like an interesting dish in their dessert menu, but we were sadly disappointed in the end. The taste of cinnamon stubbornly overpowered the deep fried yam. The vanilla ice cream did not compliment. Fluffy waffles topped with four scoops of the melting vanilla ice cream, drizzled with homemade butterscotch sauce and lashes of bacon standing tall. This was pleasant and just enough to go around the table. A tweak - two scoops of ice cream and a dollop of peanut butter? Overall Rating: 7.5/10. I arrived that evening with no expectations whatsoever, probably influenced by the not-so-clever branding of the restaurant in the past. Only to be surprised on the first dish of my meal and got me excited till the very last - except for the taro balls that is. I felt that there were some hidden creativity in the dishes, alongside the use of ingredients that strays apart from the norm, which worked incredibly well together. But chef, you may want to speed up the serving time though, dishes weren't pipping hot when served. With a new and exciting menu firmly in place, Purple Pasta would do fine, provided the food served are consistently good. 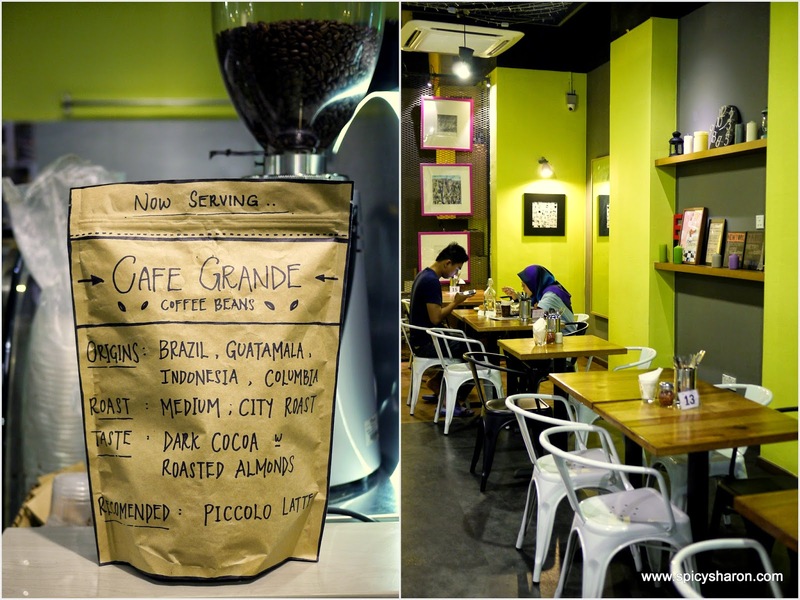 Address: D-G-06, Block D, Oasis Square, No.2A, Jalan PJU 1A/7A, Ara Damansara, Petaling Jaya. Opening Hours: 12pm - 11pm Daily.